I’ve written occasionally about ‘maintenance’ in the past, but avoid anything because frankly there isn’t much to say. There are about five important tips about shaving well, but advertising requires men’s magazines to trot them out in new ways every other issue. I write about Pankhurst now for two reasons. One, he taught me some genuinely new things recently about how to look after my beard. And two, I think it’s worth recommending his videos on maintenance and style, because while they say the same things, they look very cool doing it. I spend no time at all on my beard at the moment. That’s largely because I dislike beards that look too pruned, fussy or sharp. Mine extends slightly further down the neck than most and is only trimmed when it gets out of hand. It is not meant to be a comic-book outline to my face. But application of a little oil or conditioner, it seems, can make a big difference to the softness of the hairs, which can’t be bad. Of the two, oil takes a lot longer to be absorbed into the hairs and therefore remains greasy for a good while. Brent sells a styling conditioner that is better for this purpose. Apparently it is enriched with wheat protein. More immediately, it is scented with Brent’s house perfume, which achieves that rare feat of being intensely masculine yet rather unusual. Rum, citrus and leaves from bay trees in the West Indies contribute to its singular swing and warm, luxurious atmosphere. Again, apparently, mixing oil from bay leaves with rum to use as a fragrance was common practice among 16th-century sailors in the Caribbean. Brent’s only other tip on the beard was to regularly comb it, which you can do with most regular combs that have a fine gauge at least somewhere along their length. As to the videos, they are worth watching rather than describing in detail. Go to Brent’s site and have a look at both the instructional videos and the films. 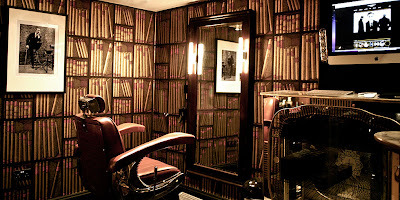 It is also worth mentioning that I’ve had cutthroat-razor shaves at several London barbers such as Murdock and they left my neck feeling rather raw. Brent, though not perfect, was the best of the lot. You can follow the discussion on Brent Pankhurst: how to maintain my beard by entering your email address in the box below. You will then receive an email every time a new comment is added. These will also contain a link to a page where you can stop the alerts, and remove all of your related data from the site.